Oil Lamp Diya Turquoise Shrine Ganesh Ganpati Hindu God idol : This beautiful Shrine Ganesha Oil Lamp statue is of brass material. This masterpiece depicts Ganesha in the sitting position and blessing. The awesome artwork notice the extremely skilled carvings of the back. this one of a kind statue a highlight in any collection. 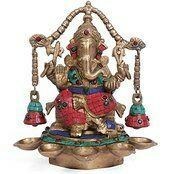 Size: 10 Inches Height x 8 Inches wide, Material : Metal Brass, Turquoise stone & coral stones, Weight : Heavy 3 Kg, Among the numerous Gods worshipped in India, Ganesha holds a special place in everybody's heart. Lord Ganesha, also known as Ganpati, Vinayaka is the younger son of Lord Shiva and Goddess Parvati. He is referred as the lord of knowledge, wisdom and a patron of arts and science.In Hindu pantheon, Lord Ganesha is worshipped first of all. Hindu people belief that saluting him in the begining of any undertaking removes all obstacles and brings success.